From Chris Redman and Brian Brohm to Teddy Bridgewater and Lamar Jackson, the University of Louisville has historically done a terrific job of producing quarterbacks. Jaden Johnson will have a chance to join that list. Johnson — a class of 2019 standout — verbally committed to the Cardinals last week. The decision came after a visit to the school for the Clemson game on Sept. 16. Verbal commitments are non-binding but the player said he was thrilled to say yes to coach Bobby Petrino. "What made me commit was the atmosphere (and) the coaching staff," he said. "The fans ... really just the whole atmosphere. They really treat you like family. The tailgating was fun; they really make good bar-b-que." Culinary delights aside, Johnson should fit in well with the Cardinals' high-octane offense, which led the nation with 549 yards per game through the first nine contests. At 6-3 and 210 pounds, Johnson has the arm to make all the throws but can also get out of the pocket and make plays when needed. As a junior, he averaged just under 200 yards per game of total offense and accounted for 19 touchdowns. Cougars' coach Chester Flowers is quick to point out though that it's not just Johnson's skill that impressed the Cardinals. It was also his football brain. "This is a young man that came in as a freshman and embraced a very complex offensive system," he said. "He never shied away from the difficult things I was wanting him to do early on. "He can make throws to every area of the field, but it's his mental ability, the ability to break down defenses, executing read-progressions ... they're seeing him do things they don't normally see a high school quarterback do. "He can get on the board right now and probably break down any defense you put up there." Johnson said the long hours were worth it. "It was real tough," he said. "There were a lot of long hard days in the summertime when I couldn't make the throws. Now the game has just really slowed down for me and I can process things a lot faster." Johnson said he plans to work on his leadership this summer before returning for his senior season with the Cougars next fall. And his coach says the best is still to come. "He's not even close to being the finished product," Flowers said. "There's so much room for him to grow and I think that's what Louisville sees in him. The ceiling is so high." Reach John Varlas at [email protected] or on Twitter @johnvarlas. One of the state's top-ranked 2019 prospects, Christian Brothers defensive lineman Bill Norton, announced Sunday night that he has committed to Georgia. "Committed to the University of Georgia #GoDawgs," Norton tweeted. The 6-foot-6, 270-pound Norton, a four-star prospect and the nation's 11th-ranked strong-side defensive end according to 247Sports composite rankings, chose the Bulldogs over offers from Alabama, LSU, Mississippi State, Ohio State, Notre Dame, Penn State, Oklahoma, Ole Miss and Tennessee. The reigning TSSAA Division II-AAA Mr. Football recipient, Norton made his decision known a little more than 24 hours after visiting Tennessee for the first time since new Vols coach Jeremy Pruitt's hiring. "He's lean; he's a really good athlete for his size; and we think he has a real knack for finding the football," Christian Brothers coach Thomas McDaniel said. "Georgia has kind of been adamant from day one that they thought he'd be a defensive lineman. In this recruiting process, some schools have leaned more towards thinking he was going to develop into an offensive lineman." Mississippi State hosted Norton on March 10, and he visited Georgia on March 3. "It's just about fit, and he really enjoyed the staff there," McDaniel said. "It's not a reflection of anything that's happened during the recruiting process recently or Georgia's success on the field last season. It was more about his visit over the summer, going to a game in the fall and kind of the rapport he has with their entire staff." 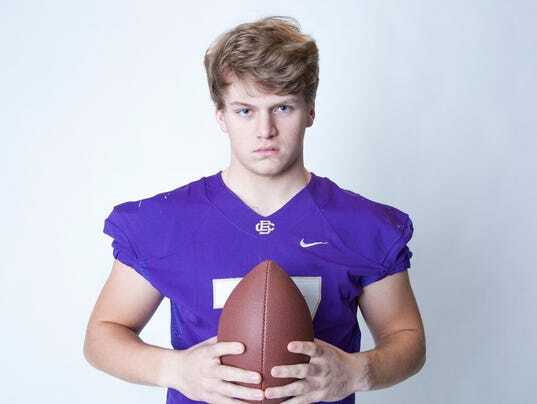 A two-way standout for Christian Brothers, Norton concluded his junior season with 45 total tackles — 16 for loss — and seven sacks for the Division II-AAA semifinalist Purple Wave. Reach Michael Murphy at [email protected] or 615-259-8026, and on Twitter @Murph_TNsports. 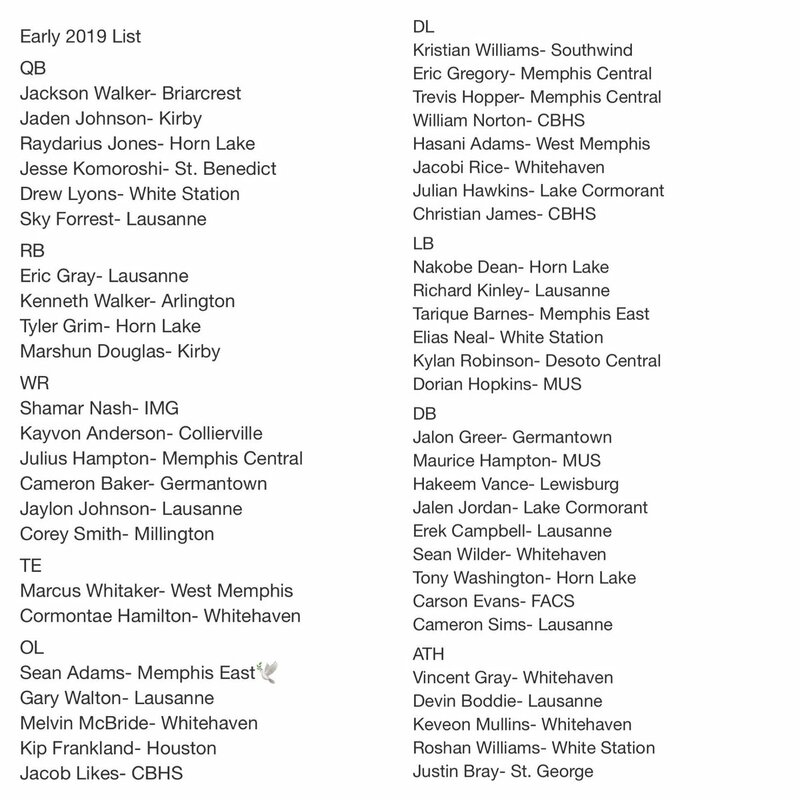 The first two players listed in this thread came from articles written by John Varlas of the Commercial Appeal. The next several players to be listed will come from different sources other then CA articles ... Twitter mostly. I'm going to feature football players from Lausanne next. Namely, Richard Kinley III, Erek Campbell, Gary Walton, Jaylon Johnson, Cameron Sims, and Eric Gray. Why these six (6)? Because I can find information on their recruitment from the Lausanne Football Twitter page is why. Richard Kinley II - DE/OLB, 6'-4", 218 lb. His Lausanne jersey number last year was #3. According to twitter, at the time of posting, Richard has offers from Austin Peay, Tenn Tech, the University Louisiana-Monroe, Mercer, UT Chat, Western Illinois, Eastern Kentucky, JSU, and TSU. Check out the HUDL video of Richard's junior season highlights. Erek Campbell - SS, 6'-0", 185 lb. His Lausanne Jersey number last year was #27. According to twitter at the time that this was posted, Erek has two (2) offers from Morehead State University, and Stetson University. However, Erek's Riv_als profile states that nine (9) schools in total are showing interest. Check out the HUDL video of Erek's Junior season highlights. Gary Walton - C/G, 6'-4". 310 lb. His Lausanne jersey number last year was #75. According to twitter at the time this was posted, Gary has four (4) offers from UT Chatt, Western Illinois, Samford, and Liberty University. Check out the HUDL highlight video of Gary's junior season. Jaylon Johnson - CB/WR, 5'-11", 155 lbs. Jaylon's Lausanne jersey number last season was #25. According to twitter at the time this was posted, Jaylon has one (1) offer from Elizabeth City State University. Jaylon's HUDL highlights of his junior season. Cameron "C4" Sims - CB/WR, 6'-2", 185 lbs. Cameron's jersey number last season was #4. According to Twitter, at the time this was posted, Cameron has received six (6) offers from Georgia State, Georgia Southern, Eastern Kentucky, University of TN at Martin, Indiana State, and Tennessee Tech. Cameron's HUDL highlight of his junior season. Eric "Juice" Gray - APB, 5'-10", 185 lb. Eric's Lausanne jersey number last season was #1. He is rated as the 20th best recruit in Tennessee, regardless of the position played, accroding to the Riv_als Top 35 list for 2018-2019 recruits. Currently Riv_als has him as a 3-star recruit. According to Eric's Riv_als profile, eighteen (18) schools are interested, and all 18 have offered. However, according to twitter, at the time of this posting, Penn State, Louisville, Minnesota, and Florida have also offerd more recently. That would take the total up to 22 schools. Check out Eric's HUDL video of his Junior Season.